As you driving south on Interstate 5 from Oregon, you are greeted with a magnificent spectacle as the freeway descends into the Shasta Valley. Mount Shasta, towering 11,500 feet over the level valley floor is the unchallenged ruler of California’s North State region. It is an unforgettable sight. It is a particularly memorable view and one of Mount Shasta’s most aesthetically pleasing profiles for a number of reasons. First, the mountain rises to its incredible heights very abruptly from a flat plain. Its magnificent stature is put on full display. Second, the great bulk of Shastina is arranged in balance with the main cone of the mountain. From the west, the mountain is somewhat off balance because of Shastina’s great size. 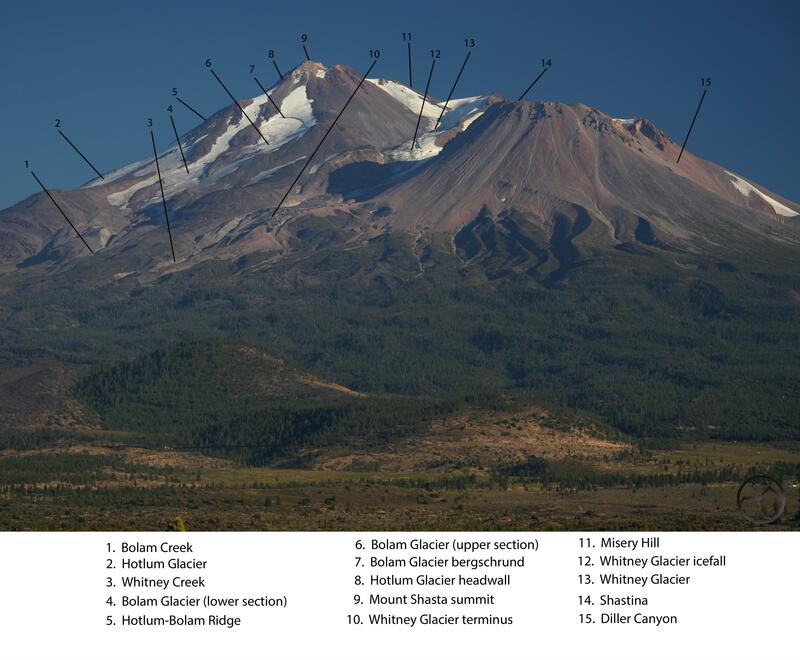 Lastly, this is an incredible view of the mountain because of the presence of two of Mount Shasta’s 4 large glaciers. The Whitney and Bolam Glaciers, massive sheets of living ice, grace the upper flanks of the mountain, blanketing the volcano in a perpetual blanket of ice. 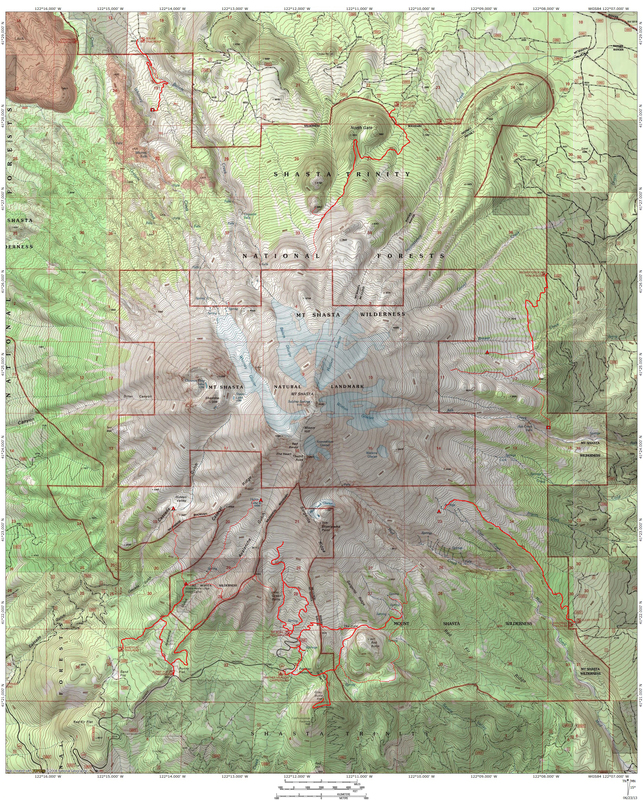 The image used for this landmark locator was chosen because it gives great detail on the glaciers. Many features, including bergschrunds and crevasses are easily discernible with the naked eye during summer, when the winter snow has melted away and the permanent ice has been revealed. 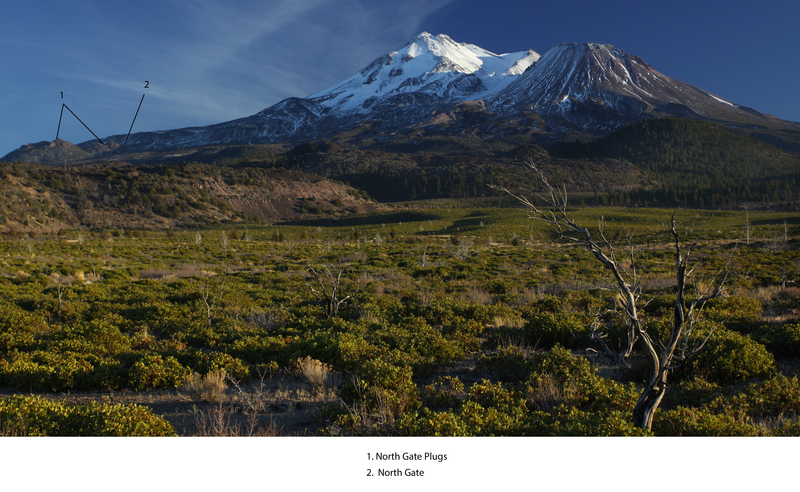 The only major landmark missing from this view is the North Gate and the North Gate Plugs, a series of minor but prominently visible volcanic peaks on the northeast side of Mount Shasta.